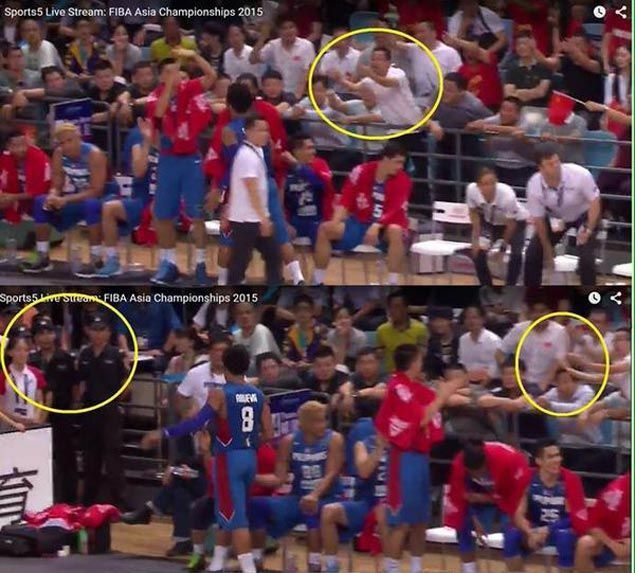 Screen grabs circulating online show Chinese fans behind the Gilas bench giving Calvin Abueva and teammates the dirty finger while police stood by. CHANGSHA, China – Action in the Fiba-Asia Championship title duel was apparently not only confined to the hardcourt. Chinese fans engaged some members of Gilas Pilipinas in a heated exchange of words in the final minutes of China’s 78-67 win over the Philippines Saturday night at the Changsha Social Worker Colleges gymnasium here. Calvin Abueva was the prime target of irate Chinese supporters after he bumped Ailun Guo with his shoulder while retreating to the Gilas bench following his fifth and final personal foul with 4:14 left and the Filipinos trailing, 72-58. 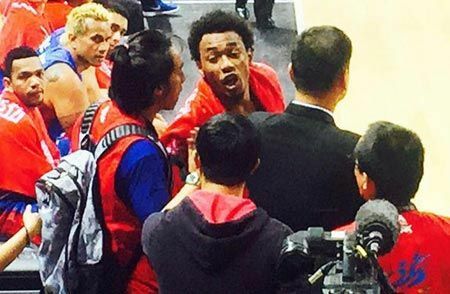 The energetic national team rookie was given the’ dirty finger’ by Chinese fans seated behind the team bench, prompting Abueva to reply. JC Intal later found himself trading barbs with the home crowd as he tried to defend Abueva. Team manager Butch Antonio tried to calm the enraged Chinese fans, but later found himself exchanging heated words, too, with the very same fans. Gilas deputy coach Norman Black and Andray Blatche’s personal trainer Rory Jones were also at the receiving end of fury of the Chinese’s fans who repeatedly yelled at the two at the ringside section of the venue. “Rory and I were just pointing at something, and then suddenly the fans behind us started yelling at us,” said a smiling Black. A camera man of TV coveror Sports5 reportedly got involved, too, in a verbal exchange with a local cameraman during the heat of the incident.